Want to get fit? Lose body fat? Gain strength? Be part of a team? Come check out what we do. Its so fun it doesn’t even feel like exercise! Achieve a healthier life, learn self defence, you will love the journey! Join us for our 12 Week Program challenge at Southside MMA Gold Coast. Ideal for all beginners or health enthusiasts looking to try something different. Participants and Members of Southside MMA receive exclusive discounts at FightLife.com.au, Pure Performance Nutrition, Magic Apple. I would like to find out the cost for my 8yr old daughter doing some casual classes, to see if she enjoys it. I am very interested!!! how do i enter??? Hi Kris how are you and thank you for your enquiry. 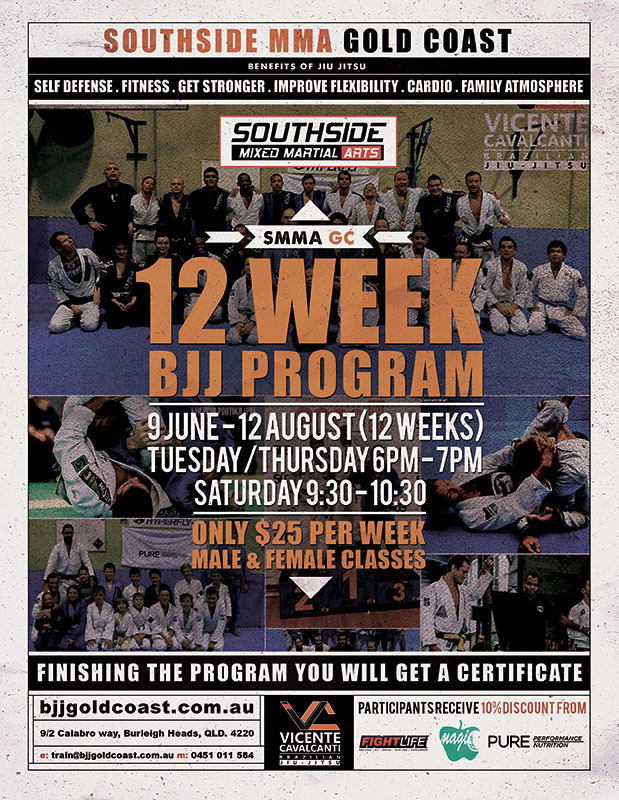 For further information please contact our head coach Vicente on 0451 011 584 or email train@bjjgoldcoast.com.au. Thank you once again and have a good long weekend.